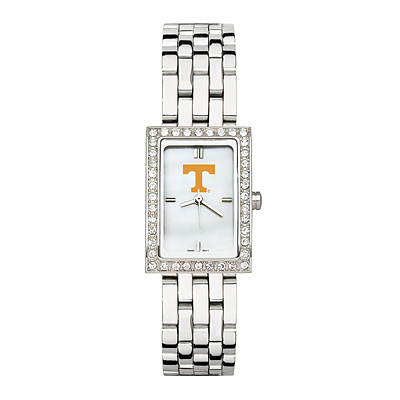 The University of Tennessee Allure watch for women has a mother of pearl dial with school color logo and raised hour markers. Features polished chrome finish alloy case with cubic zirconium crystals and stainless steel back. Comes with stainless steel bracelet strap. Contains Miyota quartz movement and comes packaged in a pillow black clamshell gift box. Limited lifetime warranty.